Clearly view details of the central and peripheral nervous system with a model of the whole human body. The sectioned head shows the brain and part of the skull; the spinal nerves are shown in relation to the skeleton, the major parts of which are also featured in section. 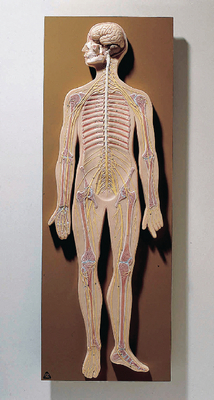 Arms and legs are positioned to show frontal and lateral elements of the nervous system.